The Cross River State chapter of the All Progressives Congress, APC has described the proposed 2018, N1.3 trillion budget submitted to the State House of Assembly by Governor Ben Ayade as an academic exercise in futility. It also accused the state lawmakers of collecting bribes from the governor to pass the mammoth budget. The party accused the state assembly of being a rubber stamp to the governor adding that the legislators had allegedly been bribed with N10 million each to pass the budget. The party while stating this in a statement signed by the State Publicity Secretary, Mens Ikpeme challenged the Governor to tell Cross Riverians the clear source of funding for the budget. The APC explained further that Mr. Ayade did not make distinctions between his modes of expenditure but merely went to the Cross River Assembly to lecture them on academic budget rather than present the state’s budget. “The budget Gov. Ayade had just done is an academic exercise in futility. He has not made distinctions between his modes of expenditure. He merely went to the Cross River Assembly to lecture them on academic budget rather than present the state’s budget. He made the state budget an intellectual paper and not a financial working document,” the statement reads in part. The party added that “Gov. 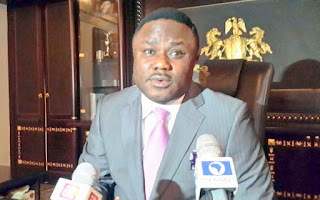 Ben Ayade announced budget of N 1.3 trillion without sources of funding, He said funding shall come from revenue generated from tolls made from Superhighway and Deep Sea Port. The deaf and dumb know that the aforementioned projects are not realistic.These are projects that shall not see the light of day as legal documentations like environmental impact assessment documentations has not been perfected. “Cross River State budget is the highest in Nigeria. Richer states like Lagos with overflowing revenue base do not have this type of huge budget expenditure. “Cross River State will never balance their budget on annual basis neither would it reflect on the state expenditure base. That means, Cross River State’s spending next year shall exceed her non existent revenue income,” the party said. Mathew Olory both denied the bribery allegations. They said the accusations by the opposition party in the state was laughable as the governor could not be seen bribing lawmakers to carry out their constitutional duties. “Why would the Governor bribe them? Is it not their constitutional responsibility to work on the budget? The claim is laughable, it’s only typical of APC in Cross River State. We don’t take them seriously because they are a group of jesters and comic characters trying to distract the government,” Mr. Ita said. Also Mr. Olory said the allegations were false. “It is not true. We can’t subject the Governor to that situation. This is not the first budget we are receiving, the budget was supposed to be submitted earlier but we got a message from the SA budget that some MDAs were not ready so when the Governor came we received the budget. There’s nothing like that. If APC wants to make any case, they should talk with facts and figures and be able to prove their case,” he said. The state recently presented N1.3 trillion budget for the 2018 fiscal year to the state assembly for deliberation and passage. Lagos state held the record with its N812 billion budget for 2017. The state (Lagos) has indicated its 2018 budget may also hit N1 trillion. Mr. Ayade, who presented the budget on Thursday in Calabar, said the proposal was designed to add value to the socio-economic development and well being of the people of the state.